Georgia Tech and Emory University have received a five-year $14.6 million contract from the National Institutes of Health (NIH) to continue the development of nanotechnology and biomolecular engineering tools and methodologies for detecting and treating atherosclerosis. Atherosclerosis typically occurs in branched or curved regions of arteries where plaques form because of cholesterol build-up. Inflammation can alter the structure of plaques so they become more likely to rupture, potentially causing a blood vessel blockage and leading to heart attack or stroke. 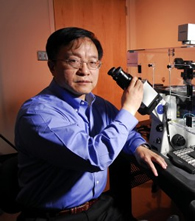 Gang Bao, PhD, who is principal investigator of the award and director of the Center for Translational Cardiovascular Nanomedicine, will lead the research team. Bao is the Robert A. Milton Chair in Biomedical Engineering in the Wallace H. Coulter Department of Biomedical Engineering at Georgia Tech and Emory University. The interdisciplinary Center for Translational Cardiovascular Nanomedicine is the second phase of the Program of Excellence in Nanotechnology (PEN), originally established in 2005 with funding from the National Heart, Lung, and Blood Institute of the NIH. This Center integrates the biomedical engineering expertise of Georgia Tech and the cardiology strengths of Emory University’s School of Medicine. The broad and long-term goal of the PEN is to improve the diagnosis and treatment of cardiovascular disease, which is the leading cause of death for men and women in the United States. During the first five years of the PEN, the Georgia Tech and Emory University researchers have made contributions in nanotechnology development, basic cardiology research and inflammatory biomarker detection. The research team has published or submitted more than 80 peer-reviewed papers, filed nine patents and established three startup companies to commercialize the nanotechnologies. Using nanoparticle probes to image and characterize atherosclerotic plaques. Diagnosing cardiovascular disease from a blood sample. Designing new methods for delivering anti-atherosclerosis drugs and genes into the body. Developing stem cell based therapies to repair damaged heart tissue. The researchers will use the suite of nanotechnologies they developed in the last five years — including molecular beacons, magnetic nanoparticles, gold nanoparticles, quantum dots, polyketals and hydrocyanine dyes — to accomplish these goals. The first goal focuses on determining if an individual’s atherosclerotic plaque will grow and rupture. Having this information would allow physicians to treat atherosclerosis more effectively. In addition to in vivo imaging of plaques using magnetic resonance imaging (MRI) and positron emission tomography (PET), the research team is developing a laboratory diagnostic test for detecting cardiovascular disease from a blood sample. The presence or levels of specific micro-RNAs, reactive oxygen species or protein markers in the blood will be tested as an indication of the presence and stage of atherosclerosis. This diagnostic approach has the advantages of being fast, inexpensive and nontoxic. Once atherosclerosis is detected in an individual, it needs to be treated. Several small molecule drugs have been identified as potent therapeutic agents for cardiovascular diseases, but their clinical utility is limited due to their water-repellant nature and short circulation half-life. A novel approach for targeted drug or gene delivery is to use nanoparticles to carry the small molecules into the body. This type of delivery system has the advantage of combining targeting, imaging and controlled release, and can be tailored to optimize circulation time and reduce toxicity. “Delivering these small molecules in a specific, sufficient and sustained manner to localized vascular lesions may significantly improve the clinical outcomes of cardiovascular diseases,” says Bao. For the final goal, the research team will use stem cells to create a personalized treatment strategy for repairing damage caused by atherosclerosis. The researchers plan to use nanotechnologies to generate and deliver patient-specific induced pluripotent stem cells to the injured vasculature and heart to repair the damage. “Our goals are ambitious as we plan to further develop our nanoscale tools and nanocardiology knowledge base, to translate the new tools and nanotechnologies to clinical applications in diagnosing and treating cardiovascular disease, and to train the next generation of leaders in cardiovascular nanomedicine,” adds Bao. Also contributing from the Coulter Department are professors Don Giddens, Xiaoping Hu, Hanjoong Jo, Shuming Nie, and W. Robert Taylor; associate professors Niren Murthy and May Dongmei Wang; and assistant professor Michael Davis. Giddens is also dean of Georgia Tech’s College of Engineering. Taylor is also the director of Emory’s Division of Cardiology and a member of the Atlanta VA Medical Center’s Division of Cardiology. Contributors from Emory University include Department of Medicine chair Wayne Alexander; Division of Cardiology professors David Harrison and Kathy Griendling, associate professor Young-sup Yoon and assistant professor Charles Searles Jr.; and Department of Radiology professor Mark Goodman. Katherine Ferrara, a biomedical engineering professor at the University of California, Davis, is also collaborating on the project.